CARABINERS OF 2 TYPES: Come with 2 kinds of carabiners (locking and non-locking), meet your family and friends' different needs. Spring clip makes the carabiners convenient to use with one hand. PREMIUM MATERIAL: Made from superior durable lightweight aluminum material. Elegant, strong and practical. MULTIPURPOSE SET: Great for daily life and outdoor activity. Hanging on the bag, key ring, bottle, Keychain clips, connecting tent and ropes, etc. 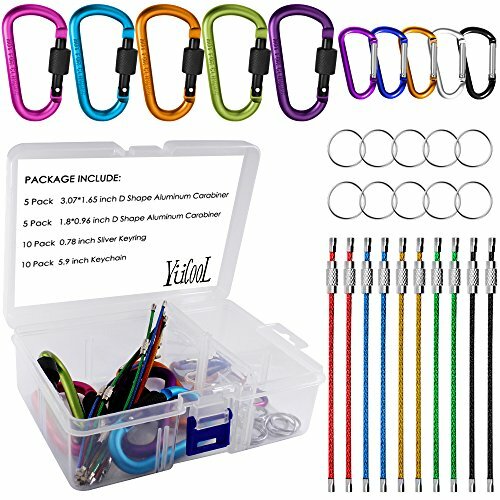 PACKAGE INCLUDE: 5 pcs D Shape Aluminum Carabiners (locking),5 pcs D Shape Aluminum Carabiners (unlocking), 10 pcs Sliver keyrings, 10 pcs Keychains (Assorted colors) and a plastic storage box.